A comic twist on The Three Little Pigs by beloved author-illustrator Frank Asch. When the Big Bad Wolf comes knocking at the door of the Pig family, he's in for a real surprise. Poppa Pig, Momma Pig and Little Pig are throwing him a birthday party--and it's not even his birthday! Before the guest of honor can even think of huffing and puffing, he's considering cake flavors, opening his present and making a birthday wish. 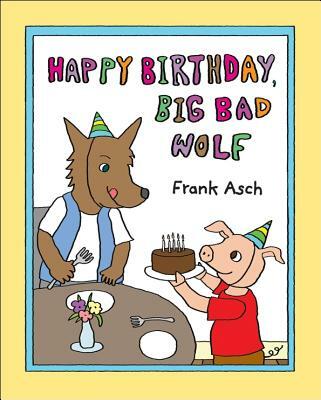 Will the Big Bad Wolf end up enjoying some birthday cake with the three pigs, or will he make them his main course? The comedy-tinged suspense and the softening up of a big, bad bully in this sweet and funny fractured fairy-tale will have children squealing with delight.